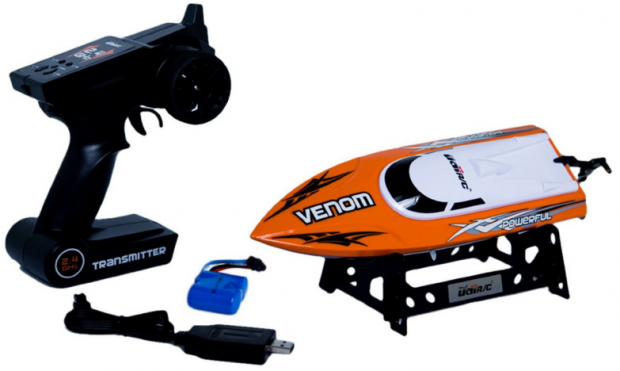 Udirc Venom 2.4GHz High Speed Remote Control Electric Boat (Orange) Just $36 Down From $110! You are here: Home / Great Deals / Amazon Deals / Udirc Venom 2.4GHz High Speed Remote Control Electric Boat (Orange) Just $36 Down From $110! Here’s a nice Amazon deal. Udirc Venom 2.4GHz High Speed Remote Control Electric Boat (Orange) is just $36 down from $110! Get yours now while it lasts! This newest USB-rechargeable electric RC speedboat from UDIRC will blow the others out of the water when it races by at 25 km/h (15 mph). It features a rugged ABS anti-tilt hull, and a water-cooled, single-prop powerful 370-size motor that combines style, speed, and affordability. Low battery alarm warns you when the boat is almost out of power so you know when to head for the shore. Self-righting feature lets you keep your boat in play even if it capsizes. The UDI001 is an exciting speedboat to see in action and even more exciting to pilot.